It's been busy here with sewing and knitting. Here's little Patric's parrot costume. Luc wants to be a pirate so once he gets his costume and puts it on, I'll show you a photo. This costume idea came from a link that was sent to me by Mary Anne of Magpie's Mumblings. She sent it to me as an addition to the boys' tickle trunk. Little did she know that I was supposed to make Patric a parrot costume. The timing was perfect. Thank you Mary Anne. All the felt, stuffing and fleece came from my stash. 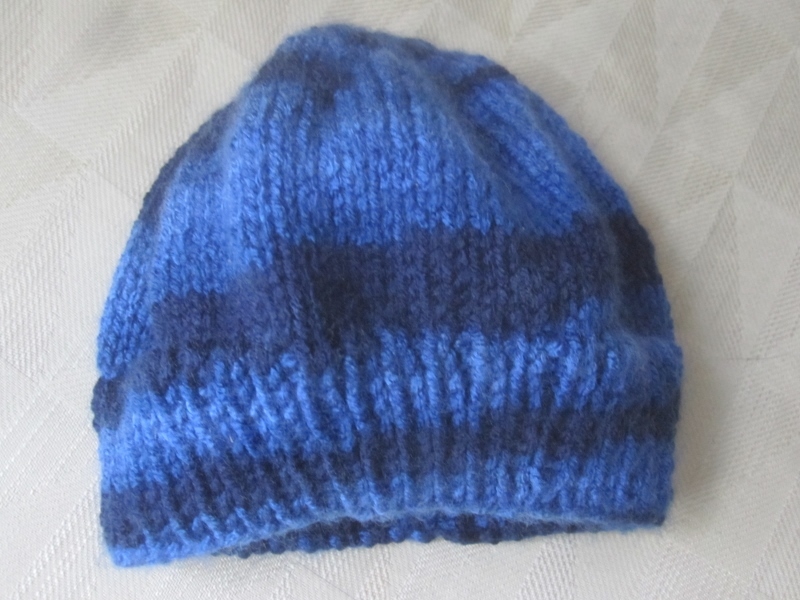 And on the knitting front, I made another hat for little Teemu. I finished it in time for the little girls to try on so I could see if the size was right for them. I just have to find some nice soft yarn. I bought this Red Heart yarn because I wanted to make a hat and I wanted to use variegated yarn. Your parrot costume is wonderful. I am sure it will get rave reviews on Halloween. That is a nice little hat. There are so many lovely variegated yarns these days. Oh my goodness, love it. You did a super job making this one. Beautiful work! I can't wait to see the pirate costume. That parrot is awesome! Ohhhh Delores....that costume is sweet!!!!! 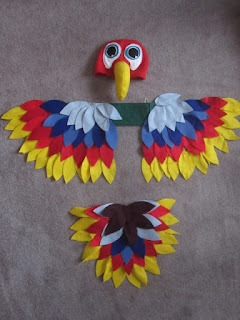 great job on the parrot costume! You did a great job on the parrot costume! Is there anything you can't do! I can't eait to see that wonderful costume in action!